Santa Monica Pier, 1998. See the California Nebula. It was the 8th day of Creation, and I was free on a mission in the City of the Angels, just having flown over the San Gabriel mountains to California. After landing in LA, I spent a few days at the edge of time where the great San Andreas Fault seems to form a cliff over the ocean. I stayed on the beach at The Georgian Hotel and elsewhere, visited friends, then did some scientific research in Pasadena at Caltech's Milikan, Robinson and Fairchild Libraries and at the Los Angeles Public Library, where I worked out the perhelion precession of Mercury using the unified field theory I believe will replace classical General Relativity. It was the highlight of my Safari. I worked out the proof next to a huge paper-mache green star reminescent of Zubeneschamali in the Balance of Libra while seated inside a high glass walkway hanging over the sparkling library scene with it's towering marble columns. I had jaunted to the stars. 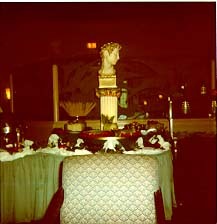 (Left) PROFILE Banquet at the Roosevelt Hotel in Hollywood. 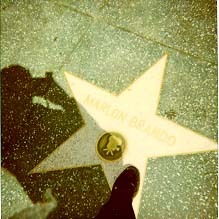 (Center) Standing on Brando's Star near Hollywood & Vine. 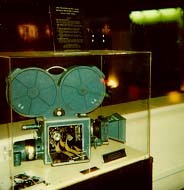 (Right) Original Technicolor Camera used to film GONE WITH THE WIND at the Roosevelt Hotel. My adventures in Hollywood included a visit to the LaBrea tar pit museum, an afternoon at Hollywood Cemetary near the graves of Douglas Fairbanks, Marilyn Monroe, Tyrone Power, and a surprisingly large number of Russians I guess Sergei Eisenstein might have brought in. 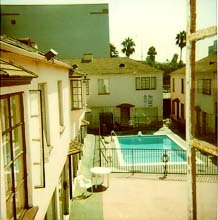 (Left) Roosevelt Hotel near Chinese Theatre. (Right) Sugarshack-looking hotel near The Sugarshack on Vine. 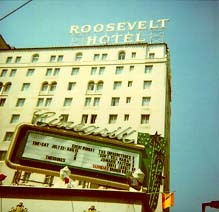 I liked to visit the Roosevelt Hotel acoss from the Chinese Theatre in the evenings and study their Hollywood Film History exhibit and read books on filmmaking and on script-writing for video documentaries from the Hollywood Library or enjoy an alcohol-free strawberry daquiri at this famous old hotel built over a strawberry patch. 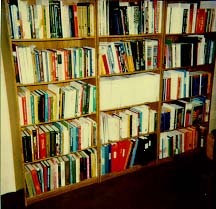 Engineering Bookcase from Honeywell Period, 1980s. As a Principal Design Engineer at Honeywell, I worked on the SST military communications terminal, for which I recieved also a nice wall decoration "Outstanding Achievement Award". I also flew to San Diego to examine military printer printhead testing in a laboratory there in order to set up a similar operation in Tampa, and inspected the printhead manufacturing operation in Mexico. 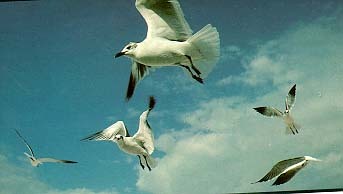 Feeding seagulls at the beach at Tampa Bay could cause such a tremendous swarm of birds in an uproar that the clouds would begin to form pictures of feeding birds around the scene. It was one of those experiments with the ghost or mythic imaging in nebulosities you could easily do. One time in St. Petersburg I saw a parrot perching on a sailor's hand in the clouds, with it's jaw animated by the wind, as if were responding to a prompt to speak. 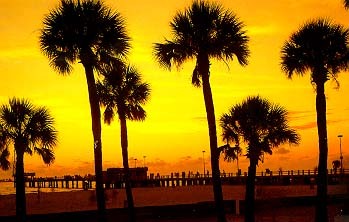 Tampa was a haunting, friendly, and beautiful place, but don't run out of money or friends!